Despite what you think, I do eat at home. In fact, I love cooking. However, taking a look in the fridge revealed that I only had condiments. A ketchup-mustard casserole didn't seem all that appealing. So Viv and I decided to pay Stupidstore a visit. I have a love-hate relationship with this place. On one hand, the prices are quite good and I actually find PC products to be decent. But, with this comes compromises. Shopping there is an exercise in frustration. If people drove the way they pushed carts, there would be mass chaos on the streets. Anyways, on our way there, I noticed a new restaurant on Broadway near Rupert named Mama's Chinese Kitchen. A bit intrigued, Viv and I paid it a visit afterwards. When we walked in, there was no mama and it sure didn't look like a Chinese kitchen. Rather, 2 fellows operated the place and it looked like a quasi-Japanese, Chinese food fair joint. We were a bit nervous. Strangely, Viv noticed the daily feature board and there were items written strictly in Chinese. That was a bit more reassuring. We were going to try their $4.99 dinner special (Rice with 2 items); but the nice man suggested we try some freshly cooked items instead. We concurred and got 3 items to share. 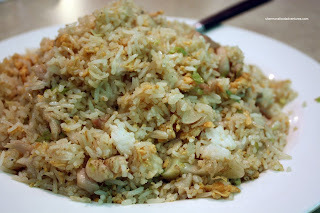 Our first dish was the Salted Fish and Chicken Fried Rice. It arrived freshly wok-fried and it was pretty darn good. There was no absence of salted fish flavour throughout the mostly well-cooked rice. I say mostly because there was the occasional rice clump due to the fact they used fresh rice. We also got the House Special Fried Noodle and it was also pretty good. 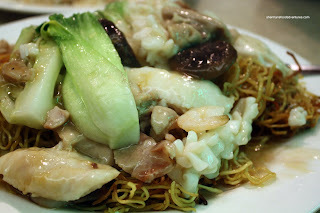 Chicken, squid, shrimp, fish, BBQ pork, shiitake and Shanghai bak choy rested atop crispy fried noodles. From the moist fish to the crunchy bak choy, all the ingredients were properly cooked. By this time we were a bit confused why this little place could produce such decent food. 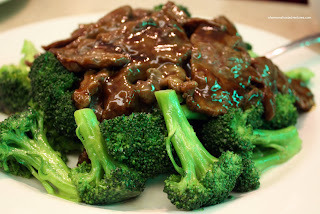 By the time we got our Broccoli Beef, the chef had taken a seat beside us and was chatting with a friend. Trying not to get noticed, I quickly snapped a photo. However, he noticed and remarked in Cantonese to his friend, "hey, that guy just took a picture of the broccoli!". Hearing this, I told him I love taking photos of food. Then he went on to say that his food was big restaurant quality. The reason? He was a former chef at Floata. Now that explains everything. No wonder the food was so decent. It didn't blow me away; but it was pretty darn good for the prices. Nothing much is over $10.00. He went on to say he can cook us anything as long as they have the raw materials - even lobster in cream sauce. Nice. 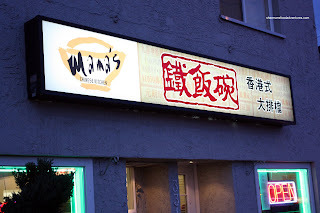 Interestingly, their Restaurant's name in Chinese, the 3 pictograph words, says "Tie Fan Wan" Iron Rice Bowl; and on the right hand end of the sign board says "Hongkong style Dai Pai Tong" street food. There is a "Golden Rice Bowl" stall @Yaohan Center food court for the last 2 decades; good @the beginning; not sure how many times it has changed hands. I live in this area and have been waiting for someone to try it out because I'm too chicken to do it first, ahha. Thanks for the review - I'll definitely check it out now! Well honestly, I passed by this place a few times w/o trying it. I finally went for it. Was pleasantly surprised. haha, I hear you on the superstore rant. Some of the people that shop there make me want to scream! The broccoli has a nice fresh colour it. I find too often restaurants let the vegetables slide. This one looks good! I was looking forward to trying this place and did so this past Saturday. Ordered the house special chow mein and the beef tenderloin with special sauce for takeout. While waiting I tried a bowl of wonton soup. Wontons were just okay. I wouldn't order them again. while driving home, the smell of the food was not all that pleasant and seemed quite fishy. When I got home and tried the order, I was very disappointed. No bok choy in the chow mein, only big chunks of celery. The chicken tasted awful and the sauce was lacking in flaour. The beef was bland and stringy. I threw the whole thing out. Wate of $20.00. Yikes! It's too bad your order was so crappy. Well, I can only assume that the main chef was not there since the experience I had was much better than yours. Yah, I figured the wontons would not be good here. Not a wonton restaurant specializing in wontons. Probably all pork I assume. The wontons had prawns!! They basically tasted like the ones I've tried to make at home!! (I usually stop on Lonsdale at the 'Neighbourhood Noodle House' between 14th & 15th. They are really good). Sam, one of the owners was very nice, we chatted while I was waiting for my order. Also during that time, another customer came in with basically I big thankyou card for him and said I'd picked the right place. So perhaps it was just an 'off' day. I'll try this place again to be sure! Gawd, that's odd! Thanks for the heads up then! Could be an "off" day, but honestly, restaurants can't have many, if not any off days since competition is so fierce. I really hope they don't go downhill.